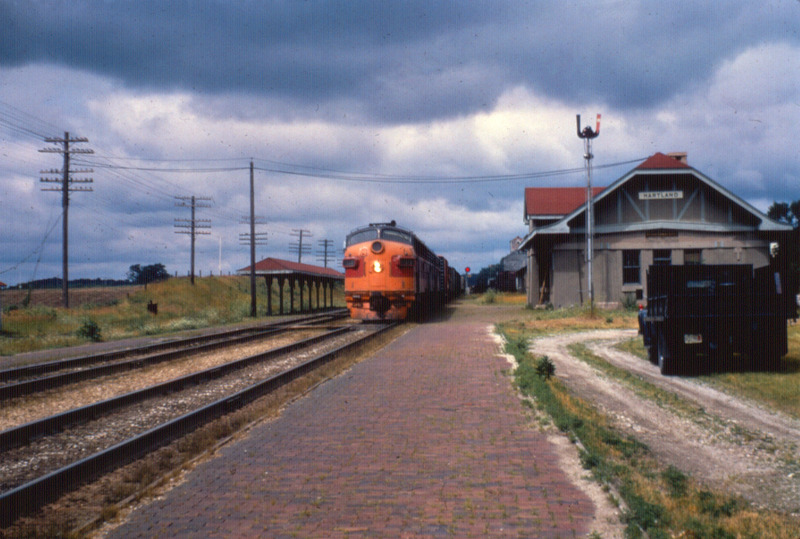 Perhaps the least recognized and traveled of the Milwaukee Road's Hiawatha services was the North Woods Hiawatha. 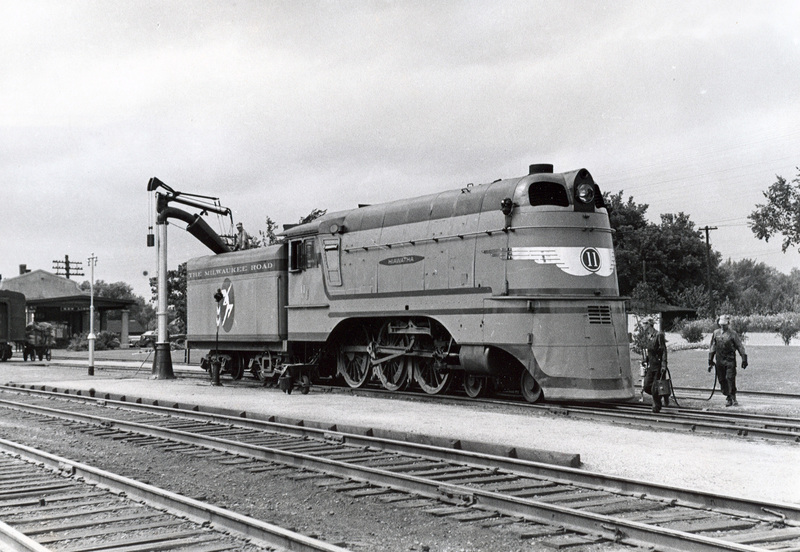 The train was launched in the late 1930s, the very first to initiate service behind the original streamliner, connecting the upper reaches of Wisconsin running northward from the main line at New Lisbon. Over the years the railroad slightly changed its name from the Hiawatha-North Woods Service to simply the North Woods Hiawatha, for which it is commonly remembered today. This particular train did not boast the fast speeds common with the other Milwaukee streamliners but did carry similar equipment, including a pair of the only two Ten-wheelers to ever receive shrouding. In 1956 the North Woods Hi lost its name but carried on via its train numbers until 1970. 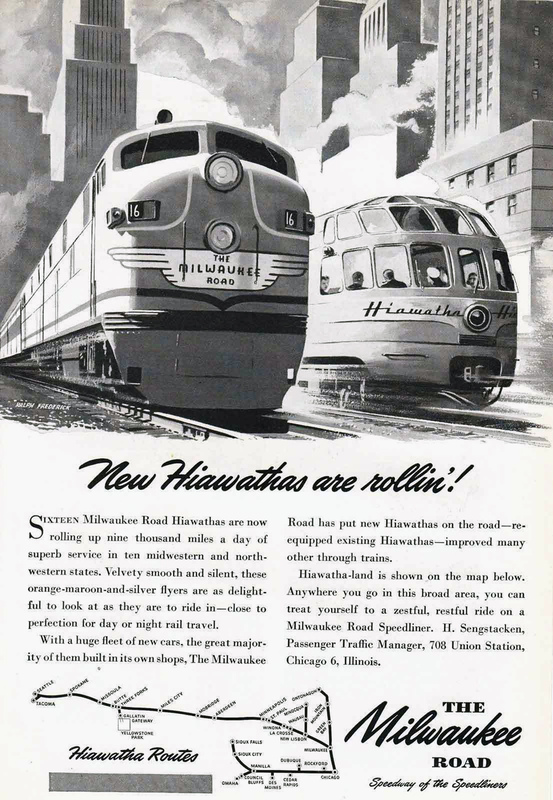 Thanks to the success of the original Hiawatha launched in late May of 1935 the Milwaukee Road quickly set about purchasing or upgrading additional equipment to field more trains. By 1937 the railroad had acquired enough new modern cars to boast other streamliners which mimicked the original. The first was known as the North Woods Hiawatha initiated on April 1, 1937 or as the Milwaukee called it, Hiawatha-North Woods Service. Within a month the Chippewa-Hiawatha joined the fleet followed by the Midwest Hiawatha in December of 1940. It is somewhat interesting that the railroad chose one of its less populated corridors to host a new streamliner but can perhaps be explained due to competitor Chicago & North Western. Until highways, particularly the Interstate, began siphoning away considerable passenger traffic, travelers often used trains to reach their vacation destinations. 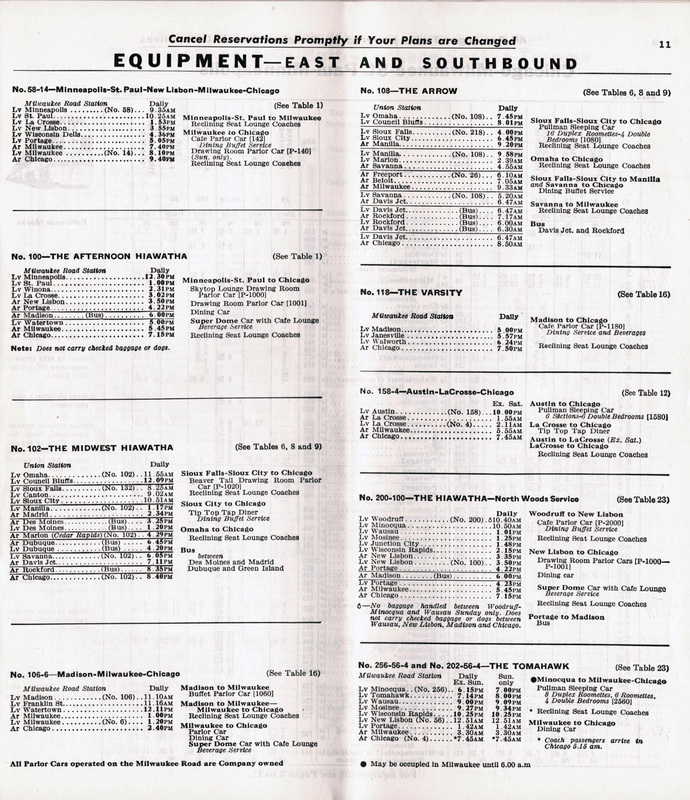 The areas of northern Wisconsin and Michigan's Upper Peninsula were once quite popular in this regard and both the Milwaukee and C&NW dispatched many trains into the region, including during the streamlined era. One of the former's principal lines was known as the Wisconsin Valley Division or simply the Wisconsin Valley Line. The route covered 187 miles from New Lisbon along the Twin Cities main line to Star Lake near the U.P. border with notable towns including Woodruff, Minocqua, Tomahawk, Merrill, Wausau, Junction City, Wisconsin Rapids, and Babcock. Typical of the Milwaukee Road's streamliners the North Woods Hiawatha's consiste included an RPO, reclining seat coaches, a "Tip Top Tap" cafe car (the train also later carried a "Tip Top Tap" diner), and utilized two of the early "Beaver Tail" parlor-observations named Nokomis and Wenonah. While relatively flat, sharp curves found on the Valley Line precluded high speed operation that was so common on the other Hiawathas. As a result, maximum track speeds were set to only 55 mph. 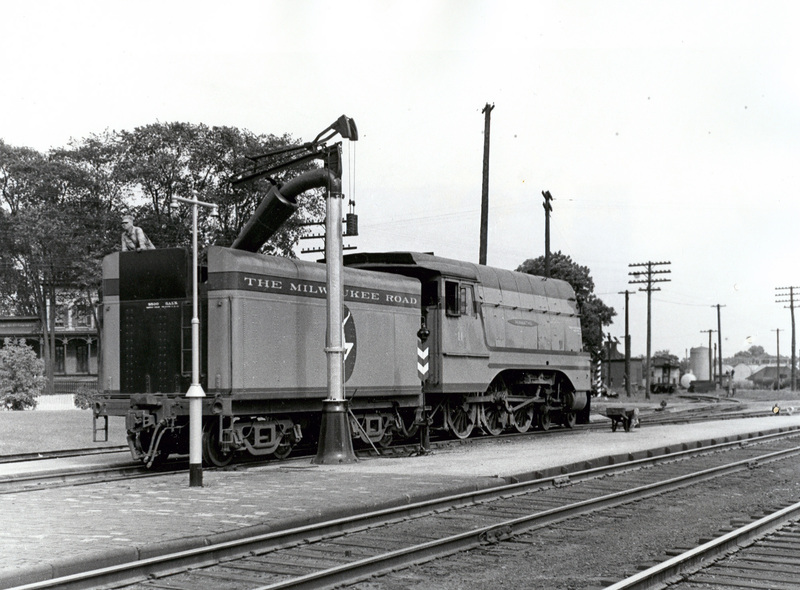 The train was powered by the only two examples of 4-6-0 Ten-wheelers to receive streamlined touches, #10 and #11. The locomotives had an interesting history. In 1899 then Chicago, Milwaukee & St. Paul placed an order with Baldwin for a batch of twenty-six Vauclain Compounds (delivered the following year). They were numbered 300-325 and listed as Class B-3. The units which became #10 and #11 were originally #315 and #306. Over the years the pair were renumbered twice (as #1615 and #1606 in 1906, and then again as #4225 and #4206 in 1913) before being rebuilt in the 1920s with simple expansion and designated as Class G-6ps. Another renumbering occurred then as 2769 and 2765, which they retained until their streamlining in 1936 where they were listed as simply Class G. The pair was virtually identical to the Class A 4-4-2s with a chromed, winged shield draped across the nose (including their number) adorning a livery of grey, maroon, and orange. As with the other streamlined steamers, #10 and #11 were elegant machines encased in their shrouding although without question the shortest, sporting a wheelbase at least 10 feet less than the other locomotives. However, they got the job done since nothing larger could negotiate the tight curves found on the Valley Line. The North Woods Hiawatha was listed as trains #200 (southbound) and #201 (northbound) on the Milwaukee Road's timetable (mimicking that of the original Hiawatha flagship, which carried #100 and #101), able to complete its journey in just over 5 hours. The North Woods was the only Hiawatha to operate a seasonal schedule; during the summer months it ran as far north as Star Lake as well as through to Chicago. However, in the off-season the train truncated between only New Lisbon and Minocqua, Wisconsin. Diesel power came after World War II, at first in the form of Alco RSC2s in 1947 (four were equipped with steam boilers for passenger service, #989-992) while the rare pair of DL-109 cab units (#14A-14B) also occasionally pulled the train and FP7s handled it in later years. Following their service the Ten-wheelers had their shrouding removed and returned to a traditional appearance during 1951; #10 became #1111 in May and #11 was numbered 1112 in October. 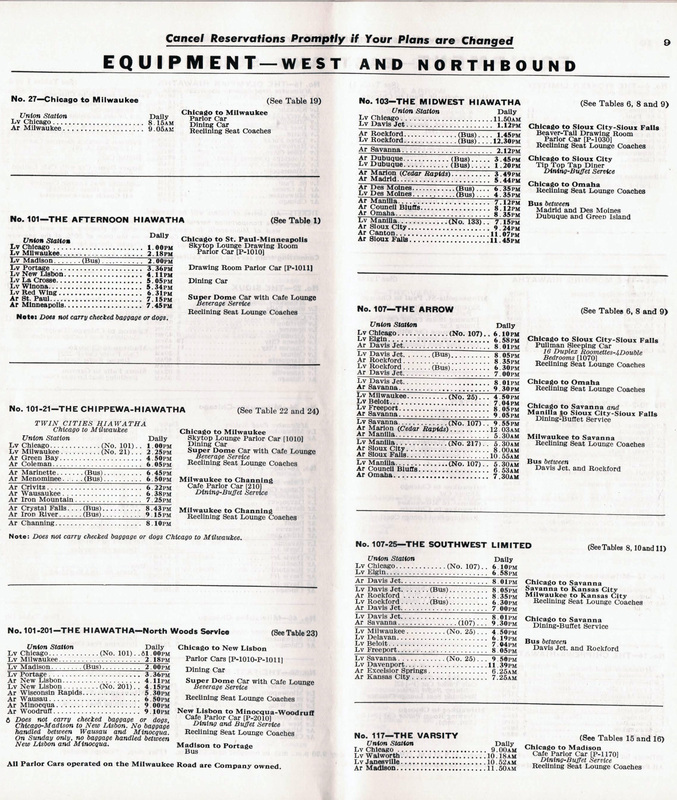 Unlike the other Hiawatha services the North Woods rarely saw new or improved equipment, especially after the war. As traffic began its unending slide the Milwaukee focused efforts on its most important corridors. During 1952 the original "Beaver Tail" parlors were removed and converted to diminutive storage cars. The same fate later beset the "Tip Top Tap" cafes and diners. On April 29, 1956, after less than 20 years in operation the railroad formally dropped the North Woods Hiawatha name from the timetable and cut back service to Wausau. After this time it carried on as another of the nameless secondary runs. Not surprisingly, accommodations by then were scarce and included little more than reclining seat coaches. A sobering photo of the train's final years is featured in Brian Solomon and John Gruber's, "The Milwaukee Road's Hiawathas," depicting an FP7 leading a single coach through Junction City on May 9, 1970. A few months later on October 8th the train was officially discontinued.